If your organization or certain project managers want to capture custom resource information for which there is no built-in Microsoft Project field, you can create one and make it available to all Project Professional users. The custom resource information can then either be entered by the project manager or calculated by Microsoft Project from other Microsoft Project fields. 1 Make sure your user profile is set with the Save Enterprise Global permission in Project Server. If you are the project server administrator or portfolio manager, you have this permission by default. 2 Log in to the project server through Project Professional. 3 In Project Professional, click Tools, Open Enterprise Global. The enterprise global opens as a special project plan called Checked-Out Enterprise Global (see Figure 21-21). Figure 21-21. Use the enterprise global template to define standards for all projects throughout the enterprise, including custom resource fields. In Project Professional, click Tools, Customize, Enterprise Fields. The Customize Enterprise Fields dialog box appears (see Figure 21-22). Figure 21-22. Use this dialog box to define custom fields for enterprise resources. 5 If necessary, click the Custom Fields tab. 6 Under Field, select the Resource option. 7 In the Type box, click the type of field you want to define, for example, Date or Flag. 8 In the list of enterprise fields that appears, select the specific custom field you want to use, for example, Enterprise Date1. 9 Click the Rename button to give a descriptive name to the custom field. 10 If you want to specify a value list, formula, or graphical indicator for the custom field, use the sections in the lower half of the dialog box. For more information about defining custom fields, value lists, formulas, and graphical indicators, see "Customizing Fields" on page 788. 11 When you're finished defining the custom field, click OK.
12 When you're finished working with the enterprise global and you want to check it back in to the project server, click File, Close. 13 In the prompt that appears, click Yes to save your changes. The enterprise global, along with your new custom resource field, is checked in to the project server and now available to all project managers. For more information about the enterprise global, see "Working with the Enterprise Global Template" later in this chapter on page 622. If the project managers in your organization will be using the Build Team dialog box or the Resource Substitution Wizard, you need to define the Resource Breakdown Structure (RBS) and associate RBS codes to the resources in your organization. The RBS defines the hierarchy of resource positions in your organization. The RBS is a special resource outline code—actually Enterprise Resource Outline Code30. However, the field name as seen in Project Professional is RBS. For more information about the Build Team feature, see "Building Your Enterprise Project Team" on page 655. For more information about the Resource Substitution Wizard, see "Assigning Tasks to Enterprise Resources" on page 666. 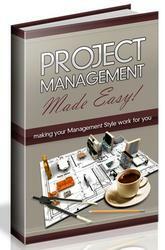 1 Log in to the project server through Project Professional. 2 In Project Professional, click Tools, Open Enterprise Global. 3 In the checked-out enterprise global, click Tools, Customize, Enterprise Fields. 4 Click the Custom Outline Codes tab. 5 Under Field, select the Resource option. All enterprise resource outline codes are listed, including the RBS at the bottom of the list (see Figure 21-23). 6 Scroll to the bottom of the list and click RBS. 7 Click Define Code Mask to specify the hierarchical format of the resource breakdown structure. 8 Click Edit Lookup Table to define the values that can be selected for any level of the RBS and therefore control the RBS data entry for each enterprise resource. For more information about defining a code mask, controlling entered values, and defining a lookup table, see "Working with Outline Codes" on page 806. 9 Under Enterprise Attributes, select the Use This Code For Matching Generic Resources check box. This selection enables project manager use of the Build Team and Resource Substitution Wizard features through RBS codes. 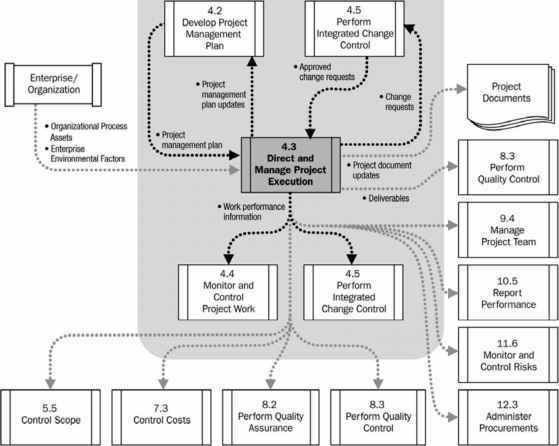 10 Select or clear the other check boxes under Enterprise Attributes as appropriate to your organization's implementation of enterprise project management. 11 When you're finished defining the RBS, click OK. The enterprise global, along with the newly defined RBS, is checked in to the project server. After defining the RBS, you can assign the appropriate RBS to each enterprise resource. Then users can sort, group, or filter resources by RBS code. More significantly, project managers can use Build Team or the Resource Substitution Wizard to replace generic resources in their project plans with real resources containing the specified RBS code. Your organization might have other ways of looking at resources and resource hierarchy besides the structure provided for in the RBS. You can define outline codes and assign those codes to enterprise resources. Then users can sort, group, or filter resources by the specific outline code. 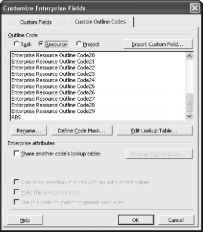 6 Select one of the outline codes between Enterprise Resource Outline Codel and Enterprise Resource Outline Code19. 7 Click Rename to give the outline code a descriptive name. 8 Click Define Code Mask to specify the hierarchical format of your new outline code. 9 Click Edit Lookup Table to define the values that can be selected for your new outline code. For more information about defining a code mask, controlling entered values, and setting up a lookup table, see "Working with Outline Codes" on page 806. 10 Select or clear the check boxes under Enterprise Attributes as appropriate to your organization's implementation of enterprise project management. 11 When you're finished defining the new outline code, click OK. Instead of defining five different resource outline codes related to a single set of resource ■ properties, you can define a single resource code to contain multiple properties that you can assign to a resource. Use multiple-value resource outline codes to define multiple skill sets, certifications, resource locations, resource languages, working arrangements, or any other related set of resource information your organization requires (see Figure 21-24). Figure 21-24. Define a multiple value outline code for enterprise resources. In Microsoft Project, 10 enterprise resource outline codes can be defined with multiple values: enterprise resource outline codes 20-29. These multiple-value resource outline codes are also known as enterprise resource multivalue fields, or ERMV. Note Multiple-value codes can be defined only for enterprise resources. They are not available for nonenterprise outline codes or for enterprise task or project outline codes. 6 Select one of the outline codes between Enterprise Resource Outline Code20 and Enterprise Resource Outline Code29. These outline codes are multivalue enterprise resource outline codes. If you need to define single values in each outline code assigned to a resource, see the earlier section, "Establishing Resource Outline Codes." 9 Click Edit Lookup Table to define the multiple values that can be selected for your new multivalue outline code (see Figure 21-25). Figure 21-25. 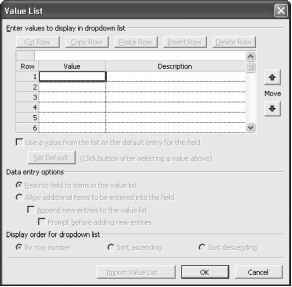 Use the Value List dialog box to set up the multiple values for the outline code. 11 When you're finished defining the multiple-value resource outline code, click OK.
Project managers can now add the multivalue enterprise resource outline code to the Resource Sheet to show the defined resource properties at a glance. In addition, the information contained in this field can be used with the Resource Substitution Wizard, Team Builder, and Portfolio Modeler. For more information about project manager use of the multivalue fields, see "Building Your Enterprise Project Team" on page 655. 1 Be sure you're logged in to the project server through Project Professional. 2 In Project Professional, click Tools, Enterprise Options, Open Enterprise Resource Pool. The Open Enterprise Resources dialog box appears. 3 In the Select table, click the names of the resources to whom you want to assign outline codes. 4 Be sure the Read/Write To Check Out option is selected. 5 Click the Open/Add button. Checked-Out Enterprise Resources appears as a project plan. The selected resources are listed in the Resource Sheet. 6 If necessary, apply the table to which you want to add the outline code field. By default, the Entry table is displayed. 7 Right-click the column heading to the left of where you want the outline code field to be inserted. Click Insert Column on the shortcut menu. 8 In the Field Name box, click the enterprise resource outline code field. Your enterprise resource outline code is listed twice: once using the generic enterprise resource outline code name (for example, Enterprise Resource Outline Code1) and again using the name you gave it (for example, Department Accounting Codes). 9 In the Insert Column dialog box, click OK.
A column containing your enterprise resource outline code appears in the Resource Sheet. 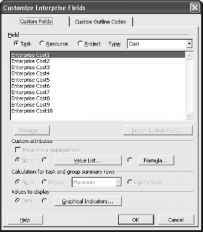 10 Click a cell in the enterprise resource outline code column. 11 Enter a value in the outline code field appropriate to the selected resource. If you had created a lookup table for the outline code, click the down arrow in the cell, and then click an entry in the list. If there is no lookup table, simply type the value in the field. If you're completing values for a multiple-value outline code, click the down arrow in the cell and then select any of the multiple values that apply to the selected resource. 12 Repeat Steps 10-11 for all checked-out resources. 13 When you're finished assigning outline codes to resources and you want to check the enterprise resources and their new information back in to the project server, click File, Close. 14 In the prompt that appears, click Yes to save your changes. The outline code information is now available to project managers and resource managers working with the resources.